Hey everyone! Last week I mentioned that I keep delaying posting because I really don't like a lot of the stuff I have prepared and I keep wanting to wait until I have something better to show you. Someone in the comments argued that this blog is supposed to be a documentation of designs, good or bad, so I'm stepping outside my comfort zone and posting these. These definitely looked better in my head, as tends to be the case whenever I try and do cats. I think if the cats had turned out more realistic then I would like this a lot more, the polka dots and the blue work well, but the cats just went terribly wrong! I don't want to just sound like I'm moaning, they're not THAT bad, and cats are always cute (even when they don't look like cats), but the perfectionist within me is unhappy with these, for whatever reason that may be! These are so cute! I honestly can't fault them! 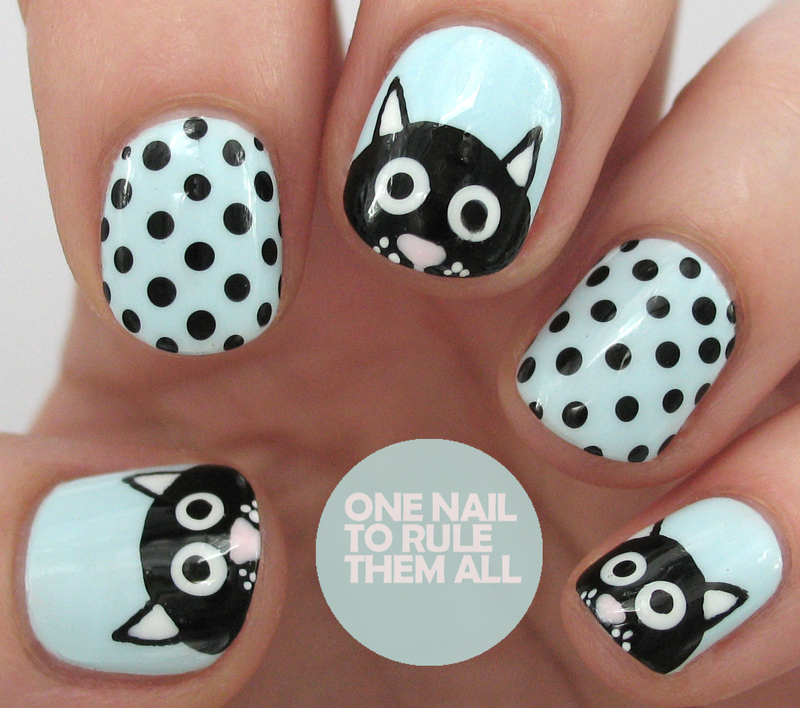 The cats are amazing and the polka dots are perfect!!! I love the colours you used!! I disagree, those cats look absolutely adorable! I really ♥ these! these are adorable and the color combo is perfect! Awwww, how cute <3 you did a perfect job there! Super cute love it ! Ohhhhhhh dear! These are such lovely nail art designs! I would love to try them and keep them in one collection so I could check on them back when I want too. Please dear, please allow me to include them on my Pinterest board for nail designs. :) <3 Loving them much :D Actually until now I am just still trying the basic nail art and I find people like you so talented to be able to do wonderful stuffs like this :) cheeeeeers!! xoxo!